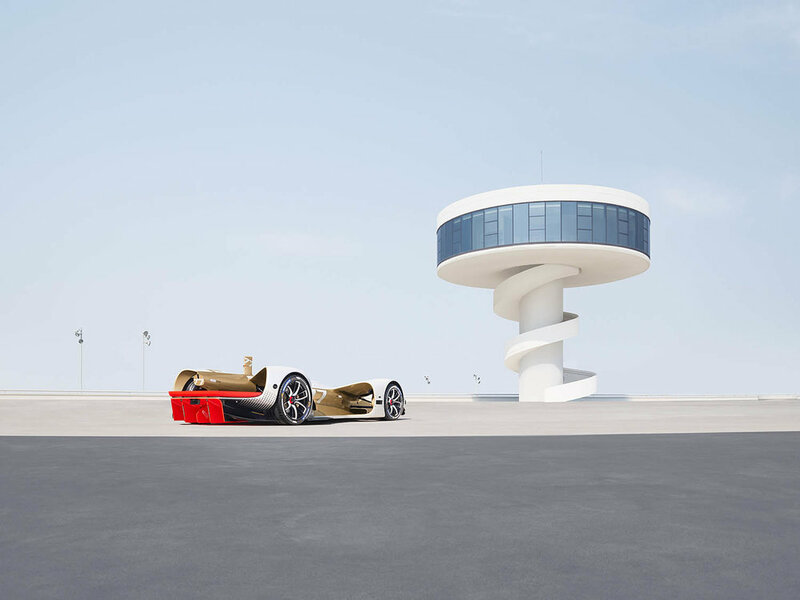 Shot by Benedict Redgrove at Oscar Niemeyer’s surrealist sci-fi Centro Niemeyer in Avilés Spain, the Roborace series celebrates groundbreaking design within two worlds: automotive and architecture. The Brazilian architect’s modernist masterpiece is the perfect backdrop for the Robocar: the car of the future. Roborace is a future-forward brand engineering racing cars with artificial intelligence. The Robocar is the world’s first self driving electric racing car, designed by Daniel Simon, the concept designer known for his automotive futurism and vehicle designs in films Tron: Legacy and Oblivion. The custom livery for this model was visualised in a collaboration between Simon and Redgrove. The livery design, like the chassis design, is ultra-modern. It is bold and graphic, exposing the beauty of the Robocar’s form. Working closely with the creative team at INK to retouch the images, Redgrove brings his distinctive attention to detail, perfecting the balance between the crafted curves of the Robocar, the futuristic atmosphere of the Centro Niemeyer and the contemporary aesthetic championed in his work.